Before ordering a couple of dozen shields with the Silver Wolf Wushu logo on them we thought it prudent to see what a camera thought of things. 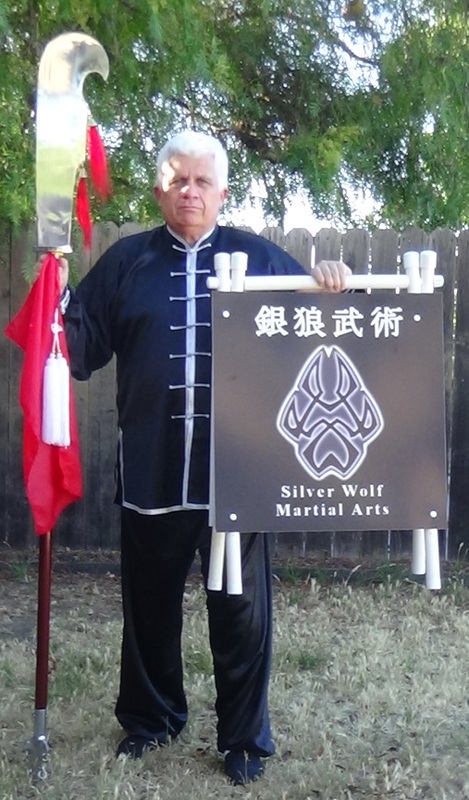 So the idea was to try various combinations of silks and weapons posed with a common background with a 24″ x 24″ street sign version of the logo nearby. Presumably, one would not need the white PVC support framework for a shield during combat. We did suffer through battlefield conditions: it was hot; the sun was bright; the seeds from the Mediterranean-adapted “grasses” kept sticking in my socks; and there were plenty of flying insects. This photo actually features BLACK silks – they are reflecting the sky (even though I am standing in a somewhat shaded place) so they look like the silk is navy blue. from Shilipu Village of Shahe city in China’s Hebei Province, where it’s called “rattan shield array”. Holding a rattan shield in the left hand and a dagger in the right, the soldiers with rattan shields fight against an opponent with a trident, a broadsword, a long spear or a wooden club. 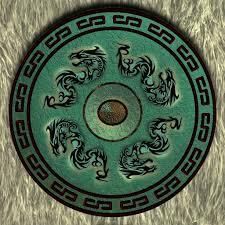 There are apparently different formations – the snakey battle array, the eight-diagram interlinking array, the pentagonal array in the shape of a plum blossom, the four-sided bewildering array and the eight-sided heart piercing array. 1. 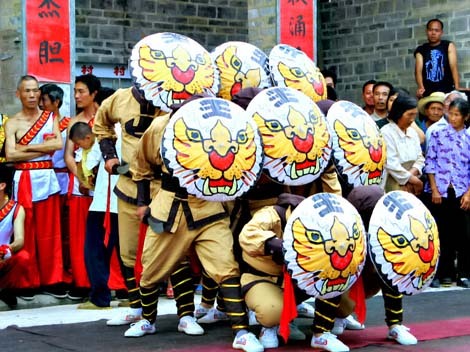 Dan-Dao-Dep or “Rattan Shield and Single Broadsword technique” was used by infantry soldiers against cavalry in battles on ancient China. 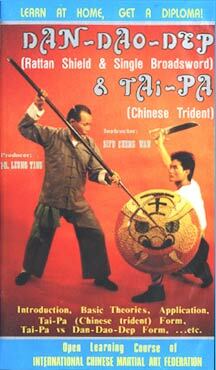 As the Dan-Dao-Dep technique is very difficult to be countered with ordinary weapons, some kung fu experts found that only the Tai-Pa (trident) techniques could effectively deal with a Dan-Dao-Dep attack. The rattan shield once sold by Wing Lam Enterprises (www.wle.com) is out of stock. 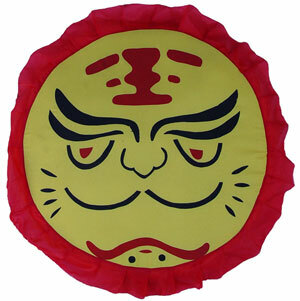 The web page (http://www.wle.com/products/RattanShield.html – navigate there from the home page by selecting Martial Arts Weapons; then Traditional Weapons; then Traditional Other Weapons) indicates 30″ in diameter, five pounds and $196.95. I have written to ask if that’s the shield used in his video. at http://www.wle.com/products/W087.html (navigate there from the home page by selecting Martial Arts Weapons; then Wushu Weapons; then Wushu Other Weapons). This shield is 25″, weighs 1.5 pounds and costs $46.95. It has a bamboo frame padded with high density foam, and the exterior is covered with a dense polyester fabric. The location is about 180 kilometers (110 miles) west of the Hubei provincial capital of Wuhan. I flew Spirit from Oakland to Las Vegas to attend the Light of Tai Chi 2015 Convention. To my surprise OAK to LAS is the second most popular flight from Oakland with more 420,000 passengers per year – exceeded only by OAK to LAX. The 6 AM takeoff requires some fortitude. We passengers were treated to a stewardess SINGING the safety instructions to the tune of “Leavin’ on a Jet Plane”.